Salvage teams are in the final stages of dismantling and removing the wreck of the stranded Riverdance ferry off the Lancashire coast. The ferry ran aground in Cleveleys in January when it hit a freak wave on the way from Northern Ireland to Heysham. Sonar equipment is being used to check the area beneath the vessel, which has been dismantled to nearly ground level. The salvage team has had to deal with people coming into the recovery area looking for cargo wreckage. 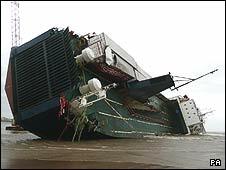 John Horner, site manager for the salvage firm, said there had been false rumours that valuable cargo may be lying around. "There was a lady down there about 11 o'clock one night with two children in a pram, in the pitch black. "We had eight tractors on the beach running oil ashore, you just can't see these people till you're on them... she was looking for whiskey." The vessel sank into the sand by Cleveleys after 23 people were rescued by the RAF. Although it was initially hoped the ferry could be refloated, the decision was later taken to break it up.